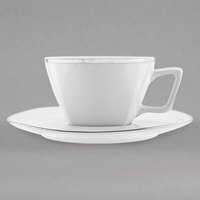 If you’re looking to add a modern and upscale look to your restaurant’s tables, this 10 Strawberry Street Lotus Silver Line porcelain dinnerware is perfect for the job. Each item in this collection features a classic white color with a subtle silver ring around the edge that provides just enough detail to be visually appealing without distracting from the look of your food. We carry multiple dishes in this line, including bowls, cups, mugs, and plates, so you can use matching pieces to serve all of your signature dishes. 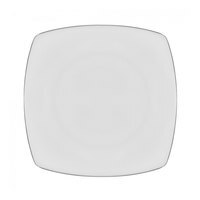 10 Strawberry Street Lotus Silver Line dinnerware is great for upscale restaurants, catering services, and banquet halls because it is made with high-quality porcelain. With their understated design, the items in this collection are likely to match most decors, which is especially perfect for catering, where the venue may be different at every event. 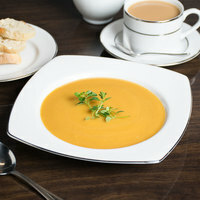 We even carry these dishes in multiple size options, so you can find something to suit all of your signature dishes. For more porcelain dinnerware, check out our Cardinal Divinity dinnerware, Cardinal Embassy dinnerware, and Cardinal Ginseng dinnerware. If you're wondering where to buy 10 strawberry street lotus silver line porcelain dinnerware, we have a large selection of 10 strawberry street lotus silver line porcelain dinnerware for sale at the lowest prices.